Any miniature wargame is greatly enhanced by realistic and evocative scenery and buildings, but commercial ready-made pieces can be expensive. Building your own can be a cost-effective and very rewarding alternative, another hobby in itself, but it can be hard to know where to start. 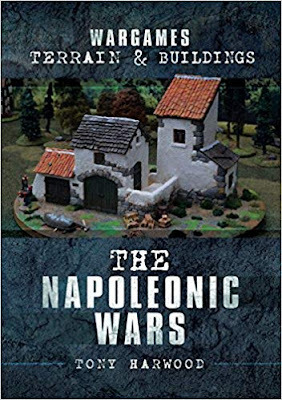 Wargames Terrain and Buildings is a series of books aimed at giving wargamers the skills, techniques and guidance they need to create their own stunning and practical model buildings. In this volume, master modeller Tony Hardwood shares his years of experience and presents the reader with a wide range of projects for the Napoleonic era. With the aid of step-by-step photographs, he guides the reader through building and finishing each of these models, which are organized in three sections of increasing complexity and encompass a range of scales and different materials. Nine projects are included but the techniques and skills demonstrated along the way, along with valuable advice on tools, construction materials and paints, can be adapted and applied to a much wider range of structures to grace your battlefields. The book is due to be launched at the end of March.